Finally, I was bored enough to give twisting another try…I spent the afternoon experimenting with product combos…so come 7pm, my hair was still wet. I cannot stand sleeping on loose, wet hair, and I needed to detangle anyway, so I decided to twist my girl Izzy up. I only used my Donna Marie Cocoa Hemp Buttermilk after cowashing with my Devacurl. I separated my hair into about 10 sections, applied the Buttermilk, then clipped them up. As I took each section down, I detangled with my Tangle Teezer after letting the Buttermilk sit. It took about an hour and a half, but golly, I felt like I was twisting forever!!!! They are wonderful can’t wait to see the end results. Elle….That does it!!! You have inspired me to style in twists. 🙂 I am only hesitant because I understand twists on soaking wet hair = shrinkage. (My hair soaks water like a sponge and takes almost 2 days to completely dry). Any suggestions? LOL…honestly…I expect and accept shrinkage. If my twists aren’t dry and I don’t want to wear them out, I wear a hat or a wig. My hair takes forever to dry as well. I wish I knew the secret. even doing time under the hooded dryer doesnt cut it. Aww and i remember when Izzy was just a little TWA. Love it! Elle, you did a beautiful job!!! Lovely twists!!! How did you sleep with these? Thanks! I just put on a satin scarf tied loosely and went to bed. In the AM they weren’t messed up. I’m not a wild sleeper though. I luv your hair! I’m co-signing with Kimmie, my two-strand twist look like ramen noodles too. I feel the same way about twists! I think it takes time to get used to wearing twists. But yours look very pretty! You would have to pay somebody to do your whole head in smaller “wear outside” twists because you have waaaayyy too much hair! can’t wait to see the twist-out! Thanks! Yea I definitely did a ton….I’m not trying to do 80! Yikes…. Most of the time when you’re not planning a particular hair style your hair comes out looking great. These are great twists to say you did it on the fly. Due to my different hair textures twists and twist out became my BF this winter. I really think I have it down to a science now. For me twists on wet or damp hair works the best for me. I use oyin’s hair dew as LI and twist with myhoneychild’s buttery soy and that’s it. Soft, shiny and defined twists. 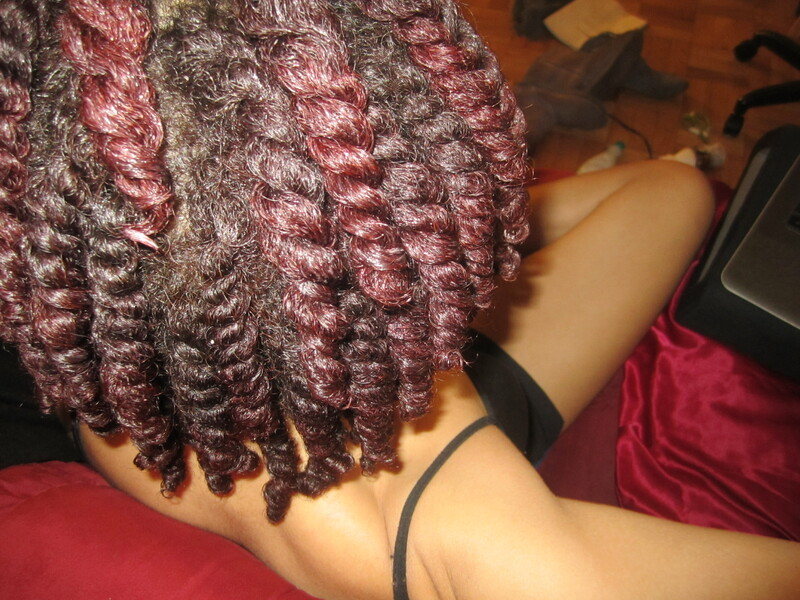 I know you didn’t have the myhoneychild jelly but some of her creams are awesome for twists and a lil goes a long way. Can’t wait to see your twist out! What exactly is the Tangle Teezer? I’ve seen it mentioned several times in the past couple of weeks. Does it make a big difference when you detangle? You did a great job with your twists! I’ve only tried to twist mine once, but I ended up looking like Buckwheat’s little sister – LOL! It’s basically a detangling brush…I don’t think it makes much difference compared to my paddle brushes, but a lot of ladies love it. There are some long threads on it on lhcf and nc. Like thick twizzler sticks, lol. They look adorable! …….okay that sounded weird, lol. Nice! I can never get my twists to be that neat and the same size. Good job! Awwwwwwwwwwwwww its so pretty!!! And I like the multicolored-ness (is that even a word?) of your hair! Wish I could achieve a mutlicolored-ness (there it is again) of light browns and blacks. That’s the first thing I thought too! In twists, my hair looks like Ramen noodles! 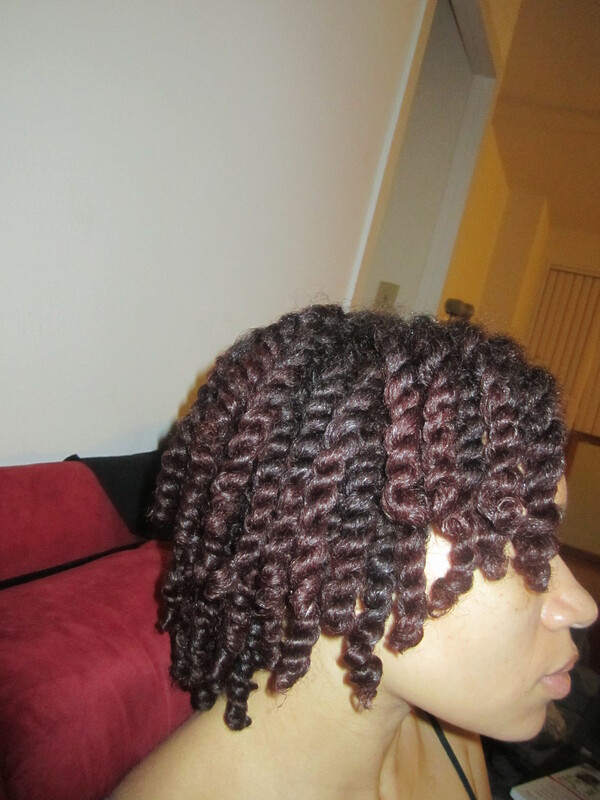 I do chunky twists at night (on dry hair) to sleep but even those aren’t so thick! Girl…you know I got a lot of hair…at least I’ll sleep well tonight!